Parva Farm Vineyard, Wine and Gift Shop01291 689636work VineyardThe vineyard produces award-winning wines, meads and sparkling wines for all occasions. The farm is tended by its owners, Judith and Colin Dudley. 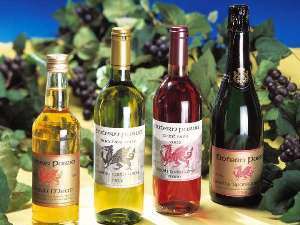 The farm is open year-round for visiting - drop by and enjoy a tour of the vineyard and a chance to try the range of Welsh wines. The vineyard produces award-winning wines, meads and sparkling wines for all occasions. The farm shop sells not only wines, but also offers meads, honey, preserves, and much more. Every day except Wednesdays. Visits outside opening hours can be arranged by contacting us beforehand. Free entry and wine tasting. Group tours with wine tasting £9pp (booked in advance). £1.50pp for self guided tours.